Hi there! It is a little sad that I can't show you the Christmas gifts I have been making yet. You know, surprises, surprises! Today I thought I'd show you the only Christmas "decor" sewing that I did this year. I made Ruby Star Wrapping's little 5-minute pouches for our advent calendar. I originally envisioned hanging them on a rustic beautiful tree made out of my off cast garden box wood like this one, but who was I kidding, that didn't get done. It worked out to hang in on our small 2nd tree that was hungry for ornaments. They sew up so quickly, you can literally make them in 5 minutes. I made 25 of them so it took a little longer. I just stamped the date on a pre-made tag and stuffed them with a few tiny things and done. Have you followed the Ruby Star Wrap Along that has been going on for the last month? 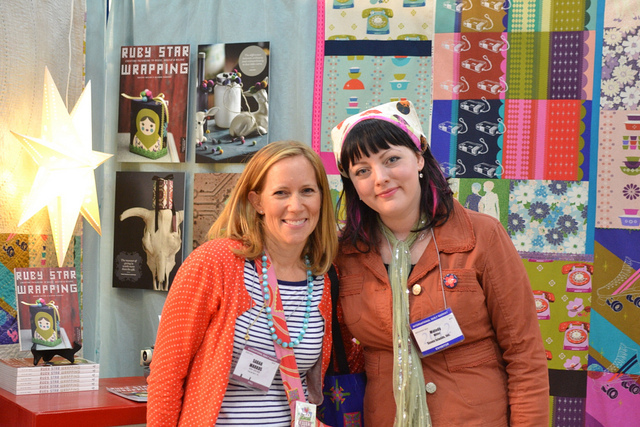 Melody gave me a copy of the book when I visited her booth at quilt market. She was so sweet, she even signed it for me. I know, she has cute handwriting even. Anyway if you haven't had a chance to look through the book, it is beautiful. Melody said she mainly meant it as an inspiration book, and inspiring it is. Pages and pages of beautiful photos and lovely writing, not to mention great projects that get your crafty wheels turning. That's that! I've got loads to do so I'm off to do it. Hope some of you are having fun making Christmas.